If I'm being honest, I should share with you that I don't have a ton of structure going into this year's PBW and how I plan to consume and cover it. In the past, I've attended 25-35 events during the ten days that is Philly's imperial week long celebration of all that is good beer. That seems to have worked plenty well to support my ability to report fairly upon it. As in the past, I'll attempt to share with you a day in advance what looks interesting to me on the calendar and what I will be shooting to attend. I'll do my best, then, to wrap up what I've encountered along the way. You can feel free to correct me if I'm mistaken, but I've been the only single independent source of PBW coverage in all ten years. (You could begin with 2008, if you'd care to check.) If I may allow my pride to proceed me just a bit here, yeah, I'm a bit proud of that. Moving along, what looks good today? You can bet on seeing me at Monk's Cafe, where Niño Bacelle from Brouwerij De Ranke will be talking beer and sharing some new beers with the prix fixe four-course, six-beer lunch. 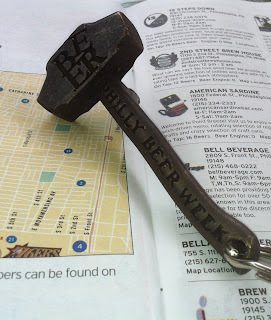 Then, I'll be looking to intercept the Hammer of Glory at a few stops along its way, while I meander the city in the general direction of Opening Tap. I'm thinking maybe Varga, Fergie's, Time, Craftsman Row Saloon, and Standard Tap, or some combination thereof. Opening Tap will close out the day for me. It's typically a great concentration of local beers and local folks, plus the culmination of the day long Hammer of Glory tour. Plus, Casey Parker and his band - Welcome To My Face - will be on stage, along with others, for our audio entertainment. If I have any gas left in the tank, sauntering over to Sancho Pistola's (Coppertail and special flatbreads), Bottle Bar East (Free Will and other special tappings), Garage (special tappings), or Barcade (special tappings) would seem to be the best way to close out the first day. Tomorrow (Friday), day 2 of Philly Beer Week, may be a rest day early in the schedule, sort of like an early bye week, for me. Partly because I'm not a fan of a Thursday start (though, I preferred March as well, but look where that got me) and partly because the weekend of Saturday and Sunday events await. If I was to venture out, I'd love to stop by Victoria Freehouse (Scotch Egg event), Jose Pistola's (Weyerbacher brunch), or Brü Craft & Wurst (Captain Lawrence and some special food menu items). More likely what may happen with me is that I'll stick close to home and check out the collaborating brewers from 2SP and De Ranke at Teresa's Next Door in Wayne.